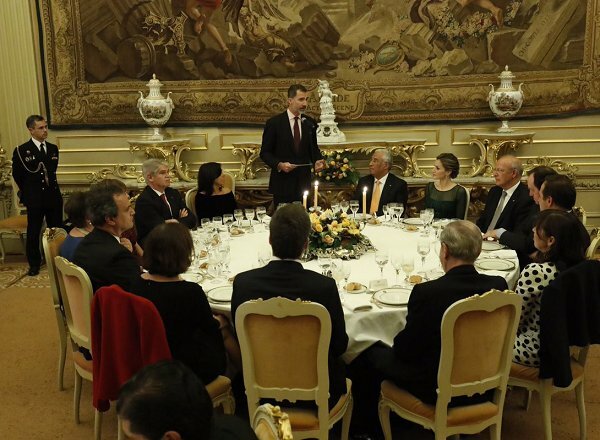 King Felipe of Spain and Queen Letizia of Spain, Portuguese Prime Minister Antonio Costa and his wife Fernanda Maria Goncalves Tadeu attended a official dinner held at the Necessidades Palace (Portuguese: Palácio das Necessidades) on November 29, 2016 in Lisbon, Portugal. Queen Letizia wears Felipe Varela Dress. Gorgeous and elegant - dress, shoes, earrings and hairstyle. And that..is how you work an Elie Saab. This dress is not a Elie Saab, is Felipe Varela's design! It's not an Elie Saab dress, it's a Felipe Varela cheap replica of the original dress. She first wore it at the Premios Príncipe de Asturias in 2013 before she became queen. By the way it looks like an ice skater costume when it's done by Varela. You are absolutely right with the 'ice skater costume'. It looks cheap! One of the rare times I don't like a dress of Letizia. What a mediocre designer Felipe Varela is, always copying other designers works...Elie Saab, late Oscar de la Renta, Prada, Burberry...and the list is getting longer everyday. He should be sued. Letizia is rocking it in Portugal ! I love everything she wore. Even her hair and make up. This dress is a Varela dress that she wore for los Premios Príncipe de Asturias in 2013. It seems he copied Elie Saab this time. but it is a beautiful color for Letizia. A bit girlish but it's nice. I agree with many of the commenters, it's obviously a copy... but a nice one, at least. Great earrings by the way but I don't like the clutch. It looks cheap. Fabulous! Tres chic! Love love LOVE the color! Oh Letizia you are game on always! Bellísima Letizia, precioso su peinado y maravillosos los pendientes. El vestido de Varela es más bonito y apropiado para una reina que el Saab, por el color verde y las mangas. El viaje a Portugal está siendo un éxito estilístico. BRAVO. WOW, magnificent and fabulous Queen of Spain. No wonder you can always see admiration in the yes of the King when he looks at his beautiful wife. Letizia, the perfect Queen! Absolutely stunning! Lovely. Beautiful dress, lovely colour, however I would have liked this dress to be a little longer. I like a swishy skirt.